Photo by Jesco Denzel for the German state information agency. Jesco Denzel is an excellent photographer. On Saturday, he made a pretty nice frame at the G7 Summit of several world leaders. 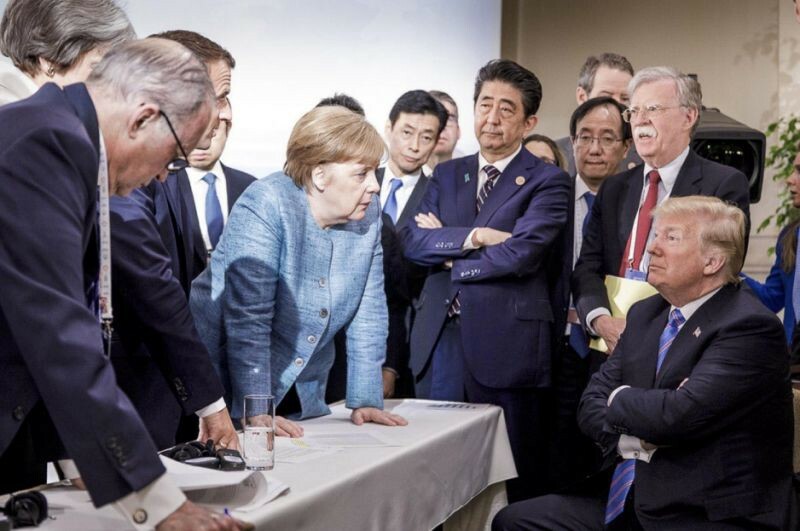 The image showed his boss, Angela Merkel, apparently giving Donald Trump the business. To be clear, giving someone the business, has nothing to do with tariffs or international trade practices. This is the kind of business I’m talking about. Like most of you, I first saw the frame on Twitter, and then I saw it again, and again. It went viral, fueled mainly by people who don’t like Trump… which I found interesting. Most of us think of photographs as windows. To look at a photograph is to look through a window at whatever the photographer wants you to see. This is a valid, but somewhat naive way to look at photographs. When you’re trying to use photos to create a visual narrative, promote a brand, or champion a certain point of view, it can be downright tricky. Big corporations pay big money to create images to do these things, and their efforts fail as often as they succeed. Occasionally, these kind of photographs even backfire. This happens mainly because of arrogance. The marketer assumes they can slap a frame around a view that they want to sell you on and you’ll accept it as fact. They don’t realize that photographs are also mirrors. They don’t realize that viewing isn’t a passive act. The don’t realize that how the message is received has as much to do with the viewer as it does the sender. It’s a rookie mistake, one that governments make on a regular basis. It started with the Crimean War when the British hired Roger Fenton to make PR pictures of their campaign. It happened again when the U.S. asked Ansel Adams to put a smiley face on the internment camps holding Japanese Americans during WWII. This kind of photo-propaganda rarely works out they way The Man thinks it will. The mirror really does have two faces, and you can never predict what that second face is going to do. Of course, this didn’t stop many, some that really should know better, from declaring this photograph the de facto winner of the next Pulitzer Prize. There are two reasons this won’t happen. One, newspaper publishers vote on who wins the Pulitzer for photography and they’d rather give it to one of their own. They don’t spend much on photography these days, which makes it even more important to pretend that they still are. They simply can’t afford to give away prestigious awards to work which they can’t take credit for. Two, this isn’t a news photograph, its a public relations announcement, a visual press release. It could have been a news photograph, but as soon as the photographer’s government employer decided to use it to propagate their message, it became propaganda. Which is a shame, because it really is a good photograph, or at least it used to be. Context is everything. There’s a way to do this smart of course, but that’s not what happened. A clever PR firm lets this photograph get “discovered” by a third party, and allows it to bubble up into the mainstream. A politician, thinking they’ve got some political hay already in the barn, releases it herself. Angela, you’re not a Trump or a Kardashian, leave the social media to the professionals who really know how to leverage it. We are quite used to governments telling us to ignore what we see, especially when it comes to the work of photojournalists who are telling a story they don’t want you to hear. It makes me a tad uncomfortable when they start encouraging us to believe our own eyes. Somehow, I’ve got a feeling they’ll go back to their old ways as soon as we’re shown something that doesn’t fit their narrative. Still, I can understand why Merkel did it. This is her window and it’s the view she wants to share with you. What I can’t understand is why so many photo professionals jumped on this bandwagon. These are the people who are suppose to be visually literate. Smarter than the rest of us when it comes to images, but really, a Pulitzer already? You know who really loves this image? Yeah, Donald Trump that’s who. He might not publicly admit it (but then again he just might), but I guarantee you he does. The window he’s looking through shows him being defiant to a bunch of bullies trying to strong arm him out of his lunch money. And his supporters will agree. Photographers, the good ones, embrace their opinions and attempt to be as honest as they possibly can be. They do both of these things at the same time. Then, when their pictures are shown, they’re smart enough to let the viewer figure out what they’re seeing. That’s how you start and continue a conversation. Most politicians and governments don’t want a conversation. They just want to persuade you to agree with them, and that’s why they have such a hard time using photography for propaganda purposes. Good photography starts conversations, it doesn’t end them.